Tree removal techniques included cross braces for safety. The trunk was compromised and would have fallen without bracing. The main goal of arborists is to preserve trees, however that can’t always be worked out. There are several reasons that warrant tree removal. The tree removal techniques used depend on those removal reasons plus the location of the tree on the property. Oftentimes, trees die or just become weakened over time. If you have a tree that you think might be in a diseased state or have pests or has not had enough rainfall, it is important not to wait for limbs to fall before you order a tree evaluation. 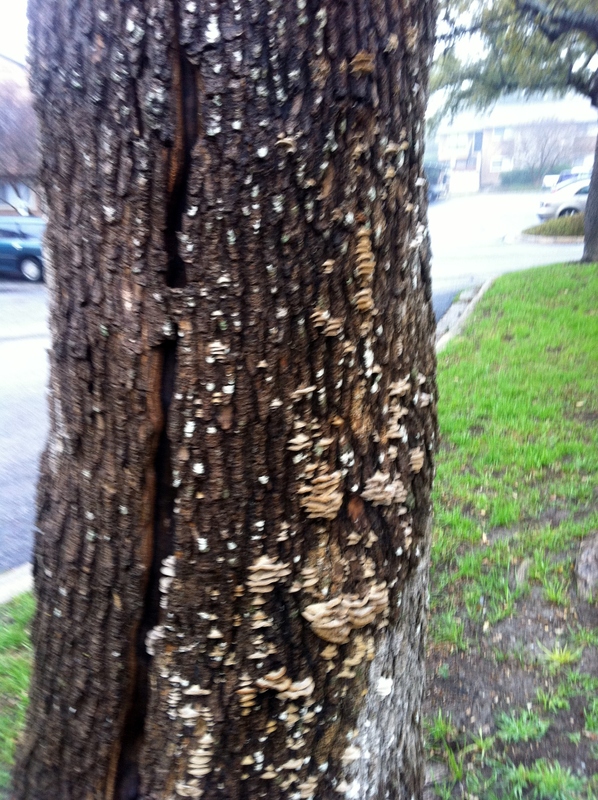 In our tree care business, we have seen a perfectly healthy-looking Cedar Elm tree fall on a house with the only sign of disease was a little bit of cottony white fungus on the trunk. Amazing when you think about it. Mighty trees can still possess a beautiful canopy while pest and disease causes a hollowed out interior or weak spot. All trees have an average life span. While oak tree may live for centuries, a Chinese Pistachio may be at the end of its life in only 50-60 years. Ash Trees live about 35 years. Occasionally, San Antonio ice storms, lightening, or unusually windy conditions will cause trees to blow over or the trunk to break. Sometimes the tree is healthy, but blocks a distance view or commercial signage. They can stand in the way of prudent development of land. When an arborist from Canopy Tree Service meets with you to prepare the tree removal estimate, the arborist will first consider any local tree removal ordinances. 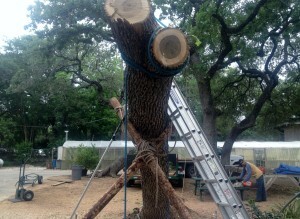 In San Antonio, Texas, for example, there is a San Antonio Tree Preservation Ordinance which is effective not only throughout San Antonio but also in its extraterritorial jurisdictional area. This ordinance oftentimes requires a tree permit to be obtained before a tree is removed, particularly with commercial properties or when an occupied home is located in a designated San Antonio Historic District. Another important consideration, is the size and weight of the tree. Is the size so large that common sense tree removal techniques will require a crane operator? Are the limbs so heavy that more than two crew members will need to carry the limb to the truck. The next consideration is how easy it will be to bring tree removal trucks and equipment to the tree location on the property. What about possible hazards to people or property posed by bringing the tree down. The safety of people and protection of surrounding property (including septic tanks) is of utmost importance to the crew at Canopy Tree Service. Before a tree is cut down, a fall direction and zone must be identified. Is the tree within ten feet of a power line? Tree removal techniques near power lines must follow utility company rules and procedures. Are there cars parked in a parking lot or on the street or driveway that could be damaged by the removal? What about pets, yard art, patio furniture, trash receptacles? Avoiding property damage is no accident with Canopy Tree Service. Tree removal techniques used by this tree care company have gained the confidence of more than 2000 customers over the 17 years the company has been in business. Commercial property owners appreciate the sensitivity given to the timing of a tree removal to avoid normal operating hours for the business whenever possible. 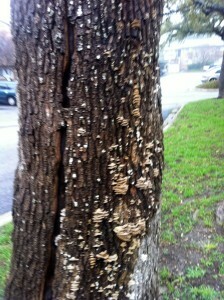 Tree fungus can kill a tree from the interior out and leave the tree hollow and subject to falling. In preparing the tree removal cost estimate, a large tree located in the backyard away from the roadway will require a considerable amount of time to remove compared with a comparable size tree near a driveway. Good tree removal techniques start with good planning and proper permits. Once the planning is complete, the job is scheduled. Crew members skilled in tree removal techniques do not work in wet trees. The danger to life and limb when operating a chainsaw on a wet day is too great. Canopy Tree Service strives to complete its tree jobs on the day scheduled but risk to crew and your property is always the priority. When the time has come to remove the tree, arborist’s ropes designed to withstand up to 6000 pounds of tensile strength are brought into the tree and limbs are identified as to order of removal. Each limb is removed and let down in a controlled fall. As the tree limbs are taken down, they are removed to the truck so there is no accumulation in the work zone. Keeping removed limbs out of the work zone is both a safety precaution and efficient use of crew time. If limbs are allowed to accumulate in a pile, they become entangled and difficult to remove. After the tree has been safely removed, the yard is raked or parking lot swept to provide a neat appearance. Meeting your expectations for the job, down to the finish up cleaning is a source of pride for us. When you have a job that depends on good tree removal techniques don’t hesitate to ask us for details about our safety plan for your home, pets, and property.